In trying to get back into the swing of things, this latest installment of Three Things focuses on one of my favorite card games from my college era. Illuminati, from Steve Jackson Games (SJG), was a favorite midnight pastime in my dorm and quickly became the go-to game whenever a bunch of us needed a study break. It was common for a resident to wander into the commons room at any hour and find a group of players attempting to rule the world through a network of conspiracy. Illuminati has each player taking the role of an ominous secret society, often based on a true/urban legend organization. 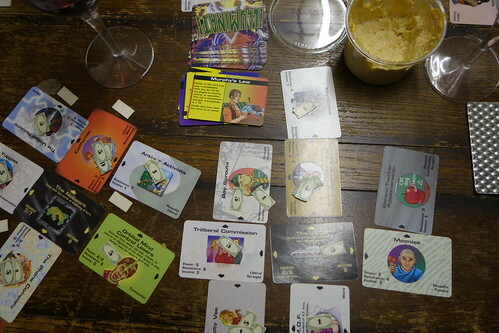 The game is completely tongue-in-cheek, seen in its cards that parodied real world organizations such as the Society for Creative Anachronism, the Congressional Wives, and the Semiconscious Liberation Army. As stated, the game takes a lot of its inspiration from the rampant mythology of civilization about secret societies and organizations. The conspiracy theory angle proved to be popular and the game won an Origins Award in 1982. Future revisions and incarnations garnered additional Origins Awards through the nineties. The entire object of the game is to take over the world through the use of various shadowy organizations, ultimately controlled by the player’s Illuminatus. The cards themselves were a major hit. Each had a power, resistance, and income value; some had particular alignments. The descriptions were often conspiracy theory in-jokes using typical SJG humor. Groups, when networked together, exerted their influence to absorb or attack other groups not aligned with the Illuminati. Favorite cards of mine included the American Autoduel Association (an in-joke for SJG’s Car Wars), the Fiendish Flouridators, Robot Sea Monsters, and the Evil Genuises for a Better Tomorrow. Announcing the network chain in play was often hilarious, just from the oddball combinations. “The Gnomes of Zurich, using the Hackers with assistance from the Democrats, Loan Sharks, and Madison Avenue, are attempting to neutralize the CFL-AIO.” And so it went. Playing a game was quick to set up and execute. Though you could have a minimum of two players and a maximum of ten, five or six seemed ideal. Each Illuminati had their own characteristics and abilities; maximizing each one while staving off your competitors in order to fulfill the special victory goal took a little practice, but you could do well aiming just at the total power structure goal. Random special cards added a nice level of randomness to the game, enough to disrupt but not destroy your game plan, and of course the luck of the dice could derail your attempts to achieve world dominance. While not really in production any more The game has morphed with the times, with a few other expansions released over the years. The rules are available via a PDF download, and boxed sets can be found at game dealers and online. My bad. I meant it’s hard to find in stores these days, as opposed to eons ago where it was in every game store I visited. My sense is SJG does a better than average job of keeping stuff available, though it may not be the version you want. They’ve done a good job of making .PDFs of out-of-print books available, for example.